Here is the list of the hotels near Quissac. Book your hotel near Quissac today, Tuesday 14 May for the best price, reservation and cancellation free of charge thanks to our partner Booking.com, leader in on-line hotels reservation. Below here is the list the 50 closest hotels of Quissac, sortable according your criteria. You will find the position of these accommodations on the Quissac hotels map. Offering a seasonal outdoor pool and barbecue, Gîtes de La Magnanerie d'Hotes is set in Sauve. Montpellier is 37 km away. Free WiFi is available throughout the property and free private parking is available on site. Gîtes de La Magnanerie d'Hotes also includes a sun terrace. The property also offers packed lunches. Bike hire is available at the property and the area is popular for horse riding. The area is popular for fishing and hiking. Nîmes is 32 km from Gîtes de La Magnanerie d'Hotes. The nearest airport is Montpellier - Mediterranee Airport, 39 km from Gîtes de La Magnanerie d'Hotes. Located in Sauve, Mas Moïse provides accommodation with free WiFi and access to a garden. A continental breakfast is available every morning at the bed and breakfast. Mas Moïse offers an outdoor pool. The accommodation offers a barbecue, a children's playground and a sun terrace. Montpellier is 48 km from Mas Moïse, while Nîmes is 37 km away. The nearest airport is Nimes-Ales-Camargue-Cevennes Airport, 49 km from the property. Offering an outdoor pool, barbecue and children's playground, La Magnanerie d'Hôtes is located 3 km from both Sauve and Quissac. A garden and free private parking are available on site. Every room at this guest house is air conditioned and is equipped with a flat-screen TV. Some rooms feature views of the mountains or river. All rooms come with a private bathroom. La Magnanerie d'Hôtes features free WiFi throughout the property. There is a shared lounge at the property. You can engage in various activities, such as horse riding and fishing. Nîmes is 33 km from La Magnanerie d'Hôtes, while La Grande-Motte is 42 km away. The nearest airport is Montpellier - Mediterranee Airport, 39 km from La Magnanerie d'Hôtes. Located in the medieval city of Sauve, this residence is set in a 6-hectare site. It features 2 swimming pools, a tennis court and fitness room with a sauna. Apartments at Les Portes des Cévennes feature a kitchen fully equipped with a dishwasher, a fridge, oven and microwave. Each apartment has a living room and a private bathroom. Bed linen is supplied. After having breakfast in the morning, guests can use the free Wi-Fi access available in public areas of the Residence Nemea les Portes des Cévennes. With free private parking on site, the residence is a one hour-drive from the famous Gard Bridge. Nimes Airport is 45 km away. Mas Pigné is located in Sauve and features its own wine cellar. Its ecologically friendly nature is demonstrated in the property’s involvement in organic agriculture. All accommodation offers garden views and an en suite bathroom. Some include a fire place while others provide a seating area and kitchen. Wine, fruit juice and olive oil are organically produced at the property. Typical dishes can be prepared using local, fresh ingredients and tours of the wine cellar are available upon request. Guests can begin organised hikes and bike rides from the property. It is ideally situated just a 45-minute drive from Nîmes and Uzès, free Wi-Fi access is available throughout the property and free private parking is possible on site. Situated in Sauve, Les Broussous provides free WiFi, and guests can enjoy a garden, a terrace and a bar. Breakfast is available daily, and includes continental and buffet options. Guests can dine in the on-site restaurant, which serves a variety of Local dishes. Nîmes is 40 km from the bed and breakfast, while Uzès is 48 km away. The nearest airport is Nimes-Ales-Camargue-Cevennes Airport, 52 km from the property. Maison atypique 11e siècle is set in Logrian-et-Comiac-de-Florian and offers barbecue facilities and a terrace. This property offers access to free WiFi. The apartment includes 2 bedrooms, a kitchen with an oven and a fridge, as well as a coffee machine. If you would like to discover the area, cycling is possible in the surroundings. Nîmes is 41 km from the apartment, while Uzès is 41 km away. Nimes-Ales-Camargue-Cevennes Airport is 53 km from the property. Set in Logrian-et-Comiac-de-Florian in the Languedoc-Roussillon region, Le Mas des Elfes has a terrace and mountain views. Guests may enjoy free WiFi. A continental breakfast is served daily at the property. Nîmes is 42 km from the bed and breakfast, while Uzès is 41 km away. The nearest airport is Nimes-Ales-Camargue-Cevennes Airport, 53 km from the property. Located in Saint-Jean-de-Crieulon, Le Mas de Crieulon features free WiFi and units fitted with a kitchen and terrace Each unit is equipped with a dishwasher, oven, a coffee machine, as well as a microwave and kettle. There is a seating and a dining area in all units. At the holiday home guests are welcome to take advantage of a spa centre. A children's playground is also available for guests at the property. Nîmes is 41 km from Le Mas de Crieulon, while Uzès is 43 km from the property. The nearest airport is Nimes-Ales-Camargue-Cevennes Airport, 52 km from the accommodation. Located in Ceyrac, Hameau Domaine Ceyrac provides accommodation with a private pool. Guests staying at this holiday home have access to a fully equipped kitchen. The holiday home comes with a flat-screen TV and 1 bedroom. The holiday home also features 1 bathroom with a bath or shower. Montpellier is 49 km from the holiday home, while Nîmes is 48 km from the property. Nimes-Ales-Camargue-Cevennes Airport is 59 km away. Le Mas Neuf des Greses offers accommodation with free bikes and free WiFi. A flat-screen TV and DVD player are available in some units. A continental breakfast is served every morning at the property. The bed and breakfast offers a hot tub. Guests can enjoy the outdoor swimming pool and garden at the property. Nîmes is 40 km from Le Mas Neuf des Greses. The nearest airport is Nimes-Ales-Camargue-Cevennes Airport, 53 km from the property. Boasting a garden and a terrace, Le Majon features accommodation in Saint-Nazaire-des-Gardies with free WiFi and mountain views. The bed and breakfast has garden views and is 43 km from Nîmes. The bed and breakfast has a flat-screen TV. Hiking can be enjoyed nearby. Uzès is 45 km from the bed and breakfast, while Alès is 23 km from the property. The nearest airport is Nimes-Ales-Camargue-Cevennes Airport, 55 km from the property. Two-Bedroom Apartment in Canaules-et-Argentier. Is located in Canaules-et-Argentières. This 3-star apartment features an outdoor pool and free WiFi. This apartment comes with 2 bedrooms, a living room and a fully equipped kitchen with a dishwasher. A TV is provided. Montpellier is 55 km from the apartment, while Nîmes is 39 km from the property. The nearest airport is Nimes-Ales-Camargue-Cevennes Airport, 52 km from the property. Le Portel des Arnaud is a B&B located in the Languedoc wine-producing region, just 300 metres from Durfort village centre. Le Portel des Arnaud features a garden with a terrace and an outdoor swimming pool. Each room has a different decoration theme and is equipped with a TV. All rooms have a private bathroom with a shower. Free WiFi access is available in most rooms. A breakfast of homemade jams, traditional cakes and fresh bread can be enjoyed daily on the terrace in warm weather. Barbecue facilities are available on request. The village also offers some local restaurants. Le Portel des Arnaud offers bike rental and there is free private parking available on site. It is a 25-minute drive from Alès town centre and 1 hour’s drive from Montpellier and its airport. The Mas d'Alphonse bed and breakfast was built in the 18th Century, and is nestled in Aigremont in the Duchy of Uzèz vineyards. On the 8-hectare estate you will find an outdoor swimming pool, sun terrace and barbecue facilities. The suite is made up of two bedrooms. On bedroom features exposed-stone walls, and both offer free Internet, a fireplace and a seating area. You can relax as you soak in the wooden bathtub in your room. Breakfast is served every morning, and the hosts can prepare evening meals upon request. Other restaurants can be found in Aigremont within 2 km. Mas d'Alphonse is within a 40-minute drive the Montpellier and Nimes TGV Train Stations. Relaxing Thai massages are available on the premises. La Chrysalide is situated in Claret. There is a private bathroom with shower in all units, along with free toiletries and a hair dryer. A continental breakfast is served daily at the property. The bed and breakfast offers a sun terrace. Montpellier is 38 km from La Chrysalide. The nearest airport is Montpellier - Mediterranee Airport, 47 km from the property. Mas Vinson is situated in Moulézan. Free WiFi is featured. All units come with a terrace with garden views, a kitchen with an oven, and a private bathroom with shower. There is also a fridge, stovetop and a kettle. Guests can relax in the garden at the property. Nîmes is 26 km from the holiday home, while La Grande-Motte is 50 km from the property. The nearest airport is Nimes-Ales-Camargue-Cevennes Airport, 39 km from Mas Vinson. Villa Chemin de la Draille is set in Massillargues-Attuech and offers barbecue facilities. Free WiFi is offered. The villa is equipped with 5 bedrooms, a TV with satellite channels and a fully equipped kitchen that provides guests with an oven, a microwave, and a washing machine. The villa offers an outdoor pool. Nîmes is 42 km from Villa Chemin de la Draille. Nimes-Ales-Camargue-Cevennes Airport is 56 km away. Holiday home chemin d'asperes is set in Tornac and offers barbecue facilities. The property features pool views. The villa is equipped with a satellite TV and 3 bedrooms. The kitchen is fitted with a dishwasher. The villa offers an outdoor pool. Nîmes is 44 km from Holiday home chemin d'asperes, while Uzès is 42 km from the property. The nearest airport is Nimes-Ales-Camargue-Cevennes Airport, 57 km from the property. Bed and Breakfast Tornac Preferred hotel ! Set in Tornac, Les Garrigues Bleues provides accommodation with a private pool. It features free WiFi, free bikes, a garden and a restaurant. The bed and breakfast has a flat-screen TV. A continental breakfast is available daily at the bed and breakfast. Les Garrigues Bleues offers an outdoor pool. A terrace is available on site and cycling can be enjoyed within close proximity of the accommodation. Nîmes is 43 km from Les Garrigues Bleues, while Uzès is 42 km away. The nearest airport is Nimes-Ales-Camargue-Cevennes Airport, 57 km from the property. Bed and Breakfast Durfort-et-Saint-Martin-de-Sossenac Preferred hotel ! Located 20 km from the Cevennes Mountains, La Vieille Maison is set in an old silk factory and offers a garden and terrace. You can rest in the living room, by the fireplace or read one of the available books. The heated rooms are decorated with simple furniture, modern art, and have fans. The private bathrooms are fitted with a shower. A buffet breakfast is provided every morning. Guests can also request a gourmet 5-course dinner at La Halte Gourmande restaurant at an additional charge upon reservation 24 hours in advance. The meal can be enjoyed outside in the warmer months. In winter, the aperitif can be taken next to the fireplace. Other facilities are free Wi-Fi access in the rooms and in public areas, and massage treatments, available at an additional cost. Le Pont du Gard is 60 km away. It is located 40 km from Nimes Train Station and 60 km from Montpellier Airport. Guest accommodation Massillargues-Attuech Preferred hotel ! 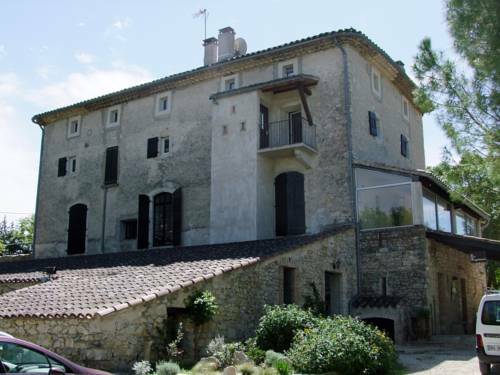 Situated in Massillargues-Attuech, Gite Anduze Le Clos Des Cigales has free bikes and barbecue facilities. Each accommodation at the 3-star guest house has pool views and free WiFi. Each room includes a terrace with views of the garden. The rooms at the guest house feature a flat-screen TV with satellite channels, DVD Player, and a private bathroom with a shower and a hair dryer. Some rooms here will provide you with a kitchen with a dishwasher. At Gite Anduze Le Clos Des Cigales the rooms come with a seating area. You can play table tennis at this 3-star guest house, and the area is popular for cycling. Nîmes is 41 km from the accommodation, while Uzès is 40 km from the property. The nearest airport is Nimes-Ales-Camargue-Cevennes Airport, 55 km from Gite Anduze Le Clos Des Cigales. Offering an outdoor pool and seasonal outdoor pool, Ancien Vignoble is situated in Lèzan in the Languedoc-Roussillon Region, 46 km from Montpellier. Nîmes is 31 km from the property. Free private parking is available on site. Featuring a terrace, the accommodation is fitted with a dining area and seating area with a flat-screen TV. There is also a kitchen, fitted with a dishwasher. A microwave and coffee machine are also available. Towels and bed linen are provided. Ancien Vignoble also includes a barbecue. La Grande-Motte is 49 km from Ancien Vignoble. The nearest airport is Mediterranee Airport, 48 km from the property. Boasting a garden, an outdoor pool and mountain views, Chambre d'Oc is situated in Lèzan. The accommodation has free WiFi. The bed and breakfast comes with a cable flat-screen TV. The bed and breakfast offers a terrace. Nîmes is 39 km from Chambre d'Oc, while Uzès is 38 km away. The nearest airport is Nimes-Ales-Camargue-Cevennes Airport, 52 km from the property. Bella Casa Villa, located in Airgremont, 25 km from Alès and 30 km from Nimes, offers an outdoor pool, table tennis, furnished terrace and boules pitch. The villa is composed of 4 bedrooms, 2 bathrooms, a kitchen and living/dining area. Amenities include heating, a TV with DVD player, washing machine and free private parking. The villa is self-catering, providing a kitchen with oven, stove, fridge, dish-washer and kitchenware. Supermarkets, restaurants and bars can be found in Lédignan, 4 km away. The Pont du Gard, an ancient Roman aqueduct bridge, is located 25 km away, and The Arena of Nimes, a Roman Amphitheatre, is located 30 km away in Nimes. Avignon is an hour’s drive away, and you are approximately 55 km from the coast. Located in Lédignan, Holiday Home Maison L'Arc En Ciel offers accommodation with a private pool. This villa features a garden. This air-conditioned 3-bedroom villa comes with a kitchen, a seating area, and a TV. The villa offers an outdoor pool. A barbecue and a terrace are available for guests at Holiday Home Maison L'Arc En Ciel to use. Nîmes is 34 km from the accommodation, while Uzès is 33 km from the property. The nearest airport is Nimes-Ales-Camargue-Cevennes Airport, 47 km from Holiday Home Maison L'Arc En Ciel. B&B La Boissière Et Le Vialat is situated in Montagnac. A terrace with garden views is offered in every unit. A continental breakfast is served daily at the property. Guests at the bed and breakfast can enjoy cycling nearby, or make the most of the garden. Nîmes is 23 km from B&B La Boissière Et Le Vialat, while Uzès is 31 km from the property. The nearest airport is Nimes-Ales-Camargue-Cevennes Airport, 37 km from the accommodation. Holiday home St Hippolye Du Fort WX-1286 is located in Saint-Hippolyte-du-Fort. Guests may enjoy the free WiFi. This holiday home is equipped with 2 bedrooms, a living room and a fully equipped kitchen with a dishwasher. A TV and a DVD player are provided. The holiday home offers an outdoor pool. Nîmes is 48 km from Holiday home St Hippolye Du Fort WX-1286, while Alès is 34 km away. Nimes-Ales-Camargue-Cevennes Airport is 60 km from the property. Below here is the hotels map of Quissac. Names and details of Quissac hotels can be shown on the map clicking on the prices icons.